Raised beds are becoming quite a popular attraction around homes in every corner of this country. 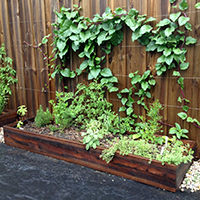 There are numerous practical reasons to start a raised garden, not to mention how great they look when done right. If you have ever wanted to build your own raised garden or flower beds, but weren't quite sure where to begin, then you have found the right resource. We have numerous articles that can lend a hand and get you started right! Building Raised Garden Beds: If you are looking for instructions on how to build raised bed gardens, look inside for great tips and techniques that will have you planting in no time! While building a raised garden is not difficult, there are considerations that you will need to think about before setting up your garden. Here we will discuss a lot of the Do's and Don'ts that you might encounter along the way. Constructing Raised Gardens: This is a great resource for learning how to construct a raised garden. Here we won't explore the different designs as much as we will all the different materials that you can choose from for constructing your project. There are pros and cons to each type of material available, and here we will break them down into easy to understand terms so you can make a smart decision. Raised Bed Garden Designs: There are a wide range of designs and styles that you can choose from when planning out your very own raised bed gardens. Whether you are planning on growing bright colorful flowers from year to year, or vegetables and herbs that you can use in your own kitchen, we have got the resource to get you started. Find a design that suits your particular application and learn how to get started! 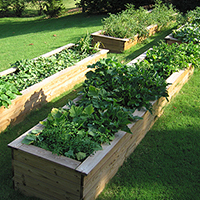 Raised Bed Garden Frames: The frame of your raised garden is one of the most important aspects of the project. Learn how to build a proper frame or box, and how to make it last. Here we will give you plenty of ideas on frames, from what materials to use, to proper assembly so that your frames will give you plenty of years of service. Raised Garden Kits: Maybe you are not very handy with lumber and tools, but you want to get into raised gardening anyway…not a problem! These days there are several manufacturers out there who have done all the leg work for you and put together kits that you can buy and assemble very quickly and easily, and have your garden up and running in no time! Raised Bed Plans: It's one thing know how to physically construct raised gardens, but what do you do with them afterwards? Planting in a small confined space requires a little bit of know-how that goes above and beyond just putting seeds or plants in the ground. We can give you a lot of tips and techniques for planting and crop rotation that will help you get the most out of your garden! Raised Garden Supplies: Every good garden starts with the right supplies. No gardener would get anywhere without the proper tools and equipment. Some tools and supplies are a necessity, while others are just designed to make life easier so that you can spend more time enjoying your garden, and less time working in it! 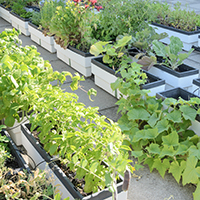 Raised Garden Systems: If you are interested in a complete package for starting a raised garden, but aren't sure of all the options that are out there for purchase, give this article a read. We've taken the time to explore all the various systems out there and can give you the breakdown of your options. Raised Garden Bed Construction: Constructing your first raised garden is a relatively easy task, but here we've broken down the different steps for you in simple, easy to understand terms that anyone can follow. We've purposely kept it easy to understand so that any skill level can get started. 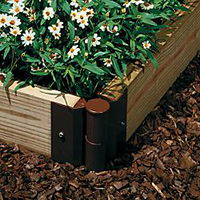 Raised Garden Planters: Not every raised garden needs to be built into a wood frame at ground level. The basics behind a raised garden is having a small, compact area where the growing conditions can be controlled. Containers are an excellent way to achieve the same results on a small scale. There are many benefits to using containers as micro gardens. Read this article to learn more about this under-utilized method of gardening. 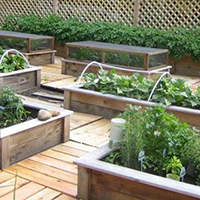 Raised Garden Planting: Planting a raised garden can be accomplished a variety of ways. The biggest concern is knowing what you want to get from your garden. If you are planting a bed of blooming annuals, the planting design is considerably different than if you are planting a vegetable garden. There are different planting techniques that you can employ to get the most efficiency from your raised garden. Crop spacing and rotation are vital and can make the difference between a mediocre garden and an exceptional one. Learn some valuable information that will help you plan your raised garden to exceed your wildest expectations. Raised Garden Soil: It isn't enough to simply build a raised garden bed, you need to know how to fill it properly for the crop you are planning to grow. Plants, vegetables, flowers, and herbs have varying soil requirements for maximum growth potential, and not all soil mixes are created equal. Learn how to mix your soil, along with what kind of amendments you can add to it for different results. Everything you ever wanted to know about mixing your own soil for your home garden!